Gadgets seem to slowly be making their way into the fashion world. Sure, they aren’t really something you see everyday out on the sidewalk, but they are starting to be created a little more. We're still not sure that we want an electronic dress, but it would be another way to make sure all of your small gadgets stay charged. Whether or not something like this would ever catch on enough to be produced is strongly debatable though. The ultrathin photovoltaic films are very thin, so they will let the fabric fall naturally. Plus they create a little bit of a design on the dress. The USB charger is attached at the waste of the dress itself. 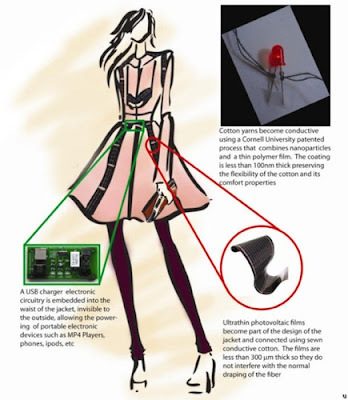 Combining fashion and technology could be incredibly tricky for the general public. Fashion is notorious for changing constantly and technology has the same issue. To combine them would mean you have a dress that will stay in trend and with the times for all of a week.